My husband and I have been living out of boxes for the last 3 weeks in preparation to move any day. That day finally came last Wednesday and I can't tell you how relieved I was! I've been busy unpacking, and yes my craft room is further along than the kitchen. This card is the first thing to be made in my new craft room...hooray! And this little card could not have come at a better time since I need one for my hubbie tomorrow. I just love this little bug! 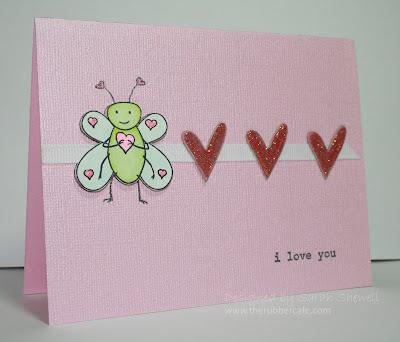 He's from the Love Bugs set which is perfect for valentines to give anyone. I first stamped the little guy where I wanted him on the card base. Then laid over the ribbon and added some stickle covered chipboard hearts. I colored in the little bug with some copics on a scrap piece of paper. Adding him with some foam pop ups made the card complete. It's not too late to whip up this card for your valentine! this is so sweet....you nailed the spirit if this image! Love it!